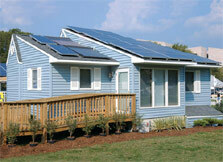 Students designed this 2002 (and beyond) solar home. We didn't want our home to look like a high-tech science fair project. We wanted it to look warm and friendly and inviting to the visitor. We wanted to build a house with solar technology in a structure that appeals to conventional taste. The 2002 University of Missouri-Rolla and Rolla Technical Institute team wanted to build a house that the average consumer would accept as comfortable and familiar. These students felt that a "futuristic" house might deter people from using solar energy. Their traditional ranch home was transported in three sections that were each mounted on trailer frames. The house is cozy and comfortable, making visitors feel right at home. Engineering students designed the house, including the sunroom on the south side, which contains all the controls for the house and is its most celebrated feature. The sunroom floor tiles absorb heat during the day and radiate it at night to heat the home. The team chose solar panels with Missouri in mind. They selected multicrystalline panels over their monocrystalline counterpart. Monocrystalline panels provide more energy under peak conditions, but multicrystalline panels perform better under variable weather conditions, which prevail in Missouri. Therefore, multicrystalline panels were more optimum for a Missouri home. The students from the Rolla Technical Institute contributed their hands-on expertise, building the cabinetry, the shelving, and the deck. The team consisted of students from the University of Missouri-Rolla, primarily an engineering school, and high school and adult building trade students from the Rolla Technical Institute (RTI), a vocational school in Rolla. The partnership brought some unique features to this house, including elegant cabinets, an innovative bookshelf, and a deck (all built by the RTI high school students). RTI students not only trained in carpentry for this project, they also trained in steel stud construction, innovative HVAC system installation, and new drafting software. They gained experience in the integration of photovoltaic power systems, too. "It's a wonderful project and learning experience," said Shawn Hawk, an RTI student. "I learned new computer skills and how to build a house, met new people, and had a lot of fun." UMR team members learned drywall installation, household wiring, and the many other challenges of basic home construction.